"A day may come when the courage of men fails, when we forsake our friends and break all bonds of fellowship, but it is not this day"
How insanely powerful a statement is that? I'd heard, in retrospect, of other groups using Avatar as a unifying element and a sort rallying point for their own protests but, frankly, I didn't know much about what they were protesting about or how the movie might relate. But I think I can finally get this. Those people in Cairo and Alexandria and throughout the rest of Egypt are using the strong fictions in their lives as sources of hope and encouragement. They're using the themes of fighting for one's freedoms and taking that into the real world. 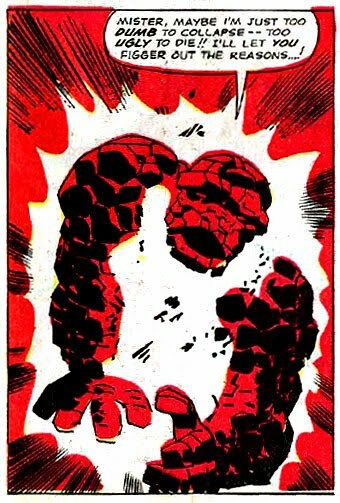 At an even smaller scale, I know I've personally used the example Ben Grimm set for me when I'm working out. "Would Ben quit?" I ask myself. "Would he stop just because he was a little sore?" But collectively pulling strength to overthrow a corrupt and decades-old powerful government? That is huge! That's not one guy with a chance encounter in front of him; that is an entire nation taking cues from all of their personal heroes and proactively effecting change. I'm sure not every person in Tahrir Square knows Tolkien; it's probably only a minority that would consider themselves fans. But how many of them see parallels with the Star Wars movies? How many of them are taking their sense of heroism from the Justice League? The fictions we gravitate to are attractive for a reason. We can relate to them. We can see something in the heroes or the situations that reminds us of our own lives. Maybe something we aspire to. Maybe a situation we want to rectify. And while we don't have magic rings or phasers or inherent super powers, we DO have those basic qualities that make us human. We have courage and strength and conviction and reason and a sense of self. Sometimes those lay a little far beneath the surface, but we look to our heroes who embody our greatest potentials and use them as guides on how to be better and do more ourselves. "But where shall I find courage?" asked Frodo. "That is what I chiefly need." At least I can now admit that I bought a jaegermonster sigil and wear it every day, and when things seem too hard (chronic illness can made everything seem too hard), I think, "now, would a jaegermonster give up? I think not." Stories are power. That's why censorship has always been an issue.